Gaining access to important biopharmaceuticals needed to treat illnesses and autoimmune diseases is one of the biggest obstacles developing countries face. Costs can be astronomical where these medications are needed most, and when doctors are able to acquire those medications they face another challenge – time. Drugs are perishable and some require refrigeration, which can be difficult to provide in the world’s poorest regions. Now, a new study appearing in the Proceedings of the National Academy of Sciences reveals a new way to improve the stability of common protein drugs and extend shelf life. Complex structures and poor chemical stability of biopharmaceuticals such as proteins, peptides and antibodies used to treat various illnesses and autoimmune diseases including rheumatoid arthritis, diabetes, multiple sclerosis and lymphoma can, over time, render drugs ineffective – the medicine simply becomes inactive. 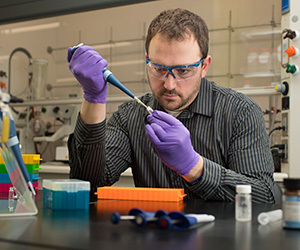 The study, led by Matthew Webber, assistant professor in the Department of Chemical and Biomolecular Engineering in the College of Engineering at the University of Notre Dame, tested a novel route for non-covalent protein modification of insulin and glucagon, both used in treating diabetes, as well as an antibody drug used in treating leukemia, lymphoma and autoimmune disease. The results demonstrated significant stability for this new additive. The glucagon samples, which typically lose stability in solution in under an hour, remained soluble for at least 24 hours. The therapeutic antibody also maintained its activity when stressed. Research was sponsored primarily by the Helmsley Charitable Trust through an award made to Robert Langer and Daniel G. Anderson at the Massachusetts Institute of Technology, who co-authored the study. Additional co-others include Eric A. Appel, Lavanya S. Thapa, Abel B. Cortinas and Siddharth Jhunjhunwala, also at MIT, and Brittany Vinciguerra and Lyle Isaacs at the University of Maryland. Webber conducted his research on the method as a postdoctoral student at the Massachusetts Institute of Technology. His research in drug formulation and delivery continues at the University of Notre Dame and the University’s Warren Family Research Center for Drug Discovery and Development. Originally published by Jessica Sieff at news.nd.edu on December 02, 2016.